April 4, 2018 - SCA announced that Kristina Enander, presently manager of SCA's Ortviken paper mill, has been named as its new Business Area President Pulp. Enander takes on her new position as of November 1, 2018. 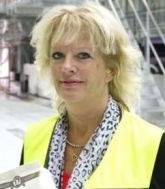 She succeeds Åke Westberg, who will retire from SCA. SCA's Business Area Pulp includes the Östrand pulp mill in Timrå, Sweden, which is nearing completion of an SEK 7.8 billion renovation and expansion project dubbed “Project Helios” that will double the mill's production capacity. Currently the mill produces 430,000 tonnes of bleached softwood kraft pulp — about half is used in SCA's own production of hygiene and printing paper and the remainder is sold to external customers. Östrand also produces 95,000 tonnes of chemical thermomechanical pulp (CTMP). Upon completion of the project, which is expected in June, the mill have the capacity to produce 900,000 tonnes of bleached softwood kraft pulp (expandable to 1 million tonnes). The core of SCA's business is the forest, 2.6 million hectares in northern Sweden. The company offers paper for packaging and print, pulp, wood products, renewable energy, services for forest owners and efficient transport solutions. To learn more, please visit: www.sca.com.